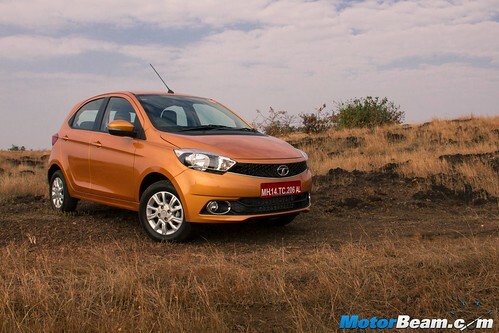 Tata Motors tasted success in the private car segment with the Indica when it was launched in 1998. The vehicle continues to be sold today but there was no replacement for it in spite of the Vista and later the Bolt coming along. This is solely because the Indica is largely sold to the commercial segment like fleet operators and thus isn’t appealing to private car buyers anymore. To fill this void, the company has developed an all new car which sits between the Nano and Bolt. 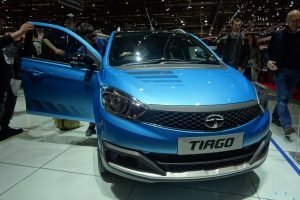 Its most ambitious project of late, the Tata Tiago has been developed from scratch in just 3 years. 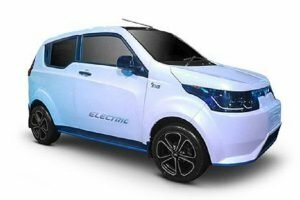 After seeing it camouflaged since months and referring it to as Kite (codename), we finally get behind the wheel of what could be a game changer for the Indian auto giant. 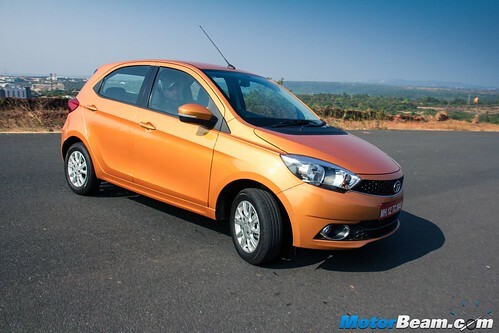 Motor Quest: The Tata Tiago’s name has been derived from the words ‘Zippy Car’. The new hatchback is based on the revised XO platform. 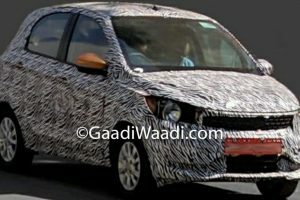 The Tiago has been positioned below the Bolt hatch and intends to replace the age old Indica in the private car segment. 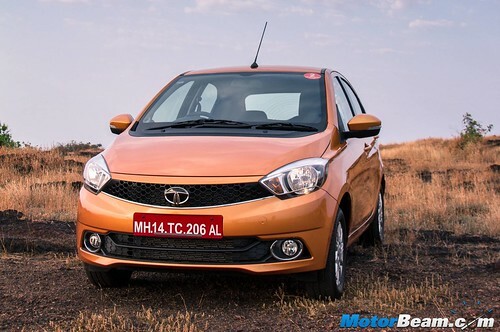 Tata will soon introduce the compact sedan version based on the Tiago. 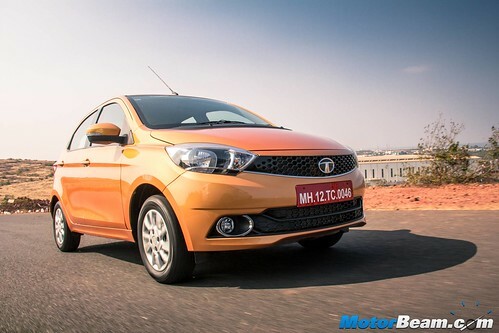 Exteriors – When you look at the Tiago as a layman you won’t be able to make out that it’s a Tata car. That typical silhouette of the Indica hatch which is evident on the Bolt is totally gone, one will also appreciate the uneven gap (a trait on older Tatas) between the body and wheels is gone. 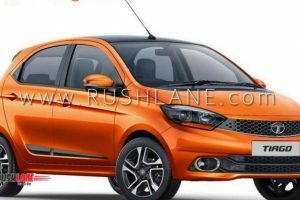 The Tiago looks fresh and up to date with Tata’s new design direction, getting inputs from its design studios in Pune, Italy and the UK. 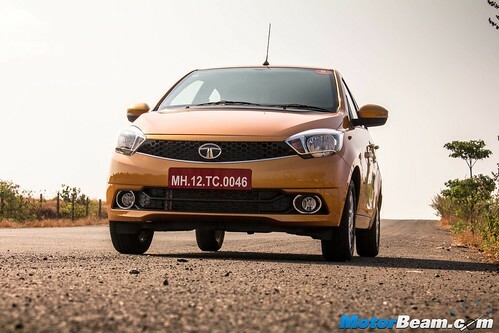 The front end gets a neat smiling face (Humanity line in Tata speak) having a wide grille connecting the sleek headlamps up front. The bonnet is flat that lends it some length and the bumper has a clean design integrating circular fog lamps. 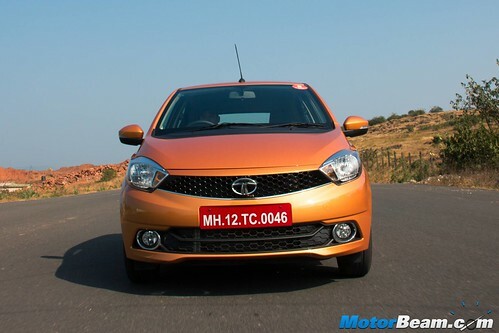 The Tata logo on the grille gets a 3D touch while there are 6 body colours on offer. The side profile of the Tata Tiago looks aerodynamic having consistent lines unlike other Tata hatchbacks with rounded and circular design elements. There is a strong crease that rises across the length of the car and blackened B-pillar to give a sporty appeal. The rear section looks complete with the jewel shaped tail lamps and muscular lines on the tail gate. The rear bumper is dual tone and gets a black panel to cut the visual bulk (there is a dummy space for a rear fog which isn’t there but will be equipped on export models). 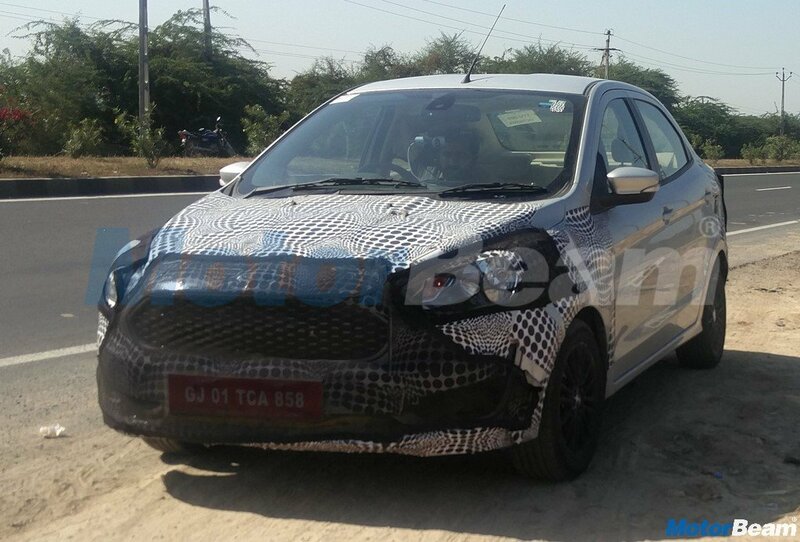 The Tiago gets a roof mounted spoiler (with gloss black air winglets which Tata likes to call spats), circular shaped rear defogger (influenced from a maze and similar to what we have seen on a recent Land Rover) with wiper. 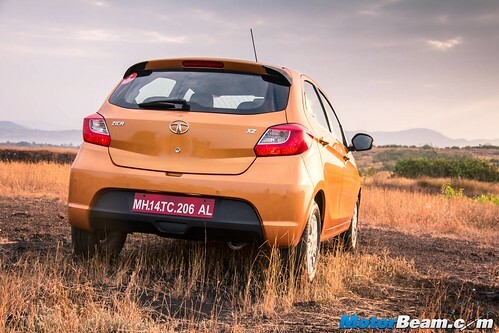 All in all a very well proportioned design from all angles makes the Tata Tiago look smart. Interiors – The Tata Tiago gets a fresh new dashboard with only a few parts being borrowed from the Bolt which is actually a good thing because the fantastic 3-spoke 360 mm steering wheel is not only good to look at but is also nice to hold and comes with ergonomically positioned audio controls. 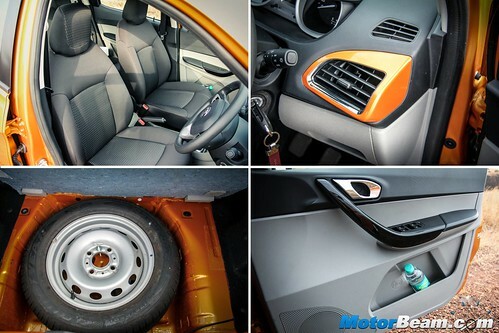 Just like the Zest and Bolt, the Tiago’s cabin is well put together and is a step in the right direction as far as quality, fit and finish goes. 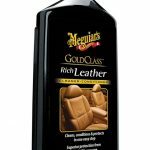 The use of colours too are fresh and the company states it has firmly banned the usage of beige in the interior of its cars. 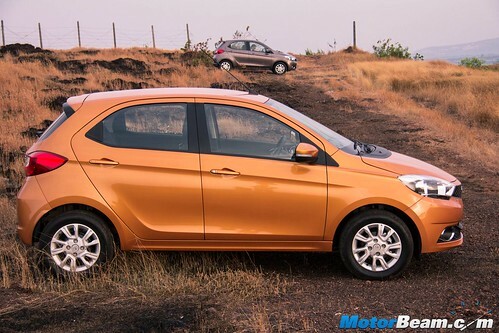 Thus the Tiago gets a two-tone black and grey cabin which looks different in a good way. The instrument cluster gets similar colours and dials as the Bolt with the MID being identical too. 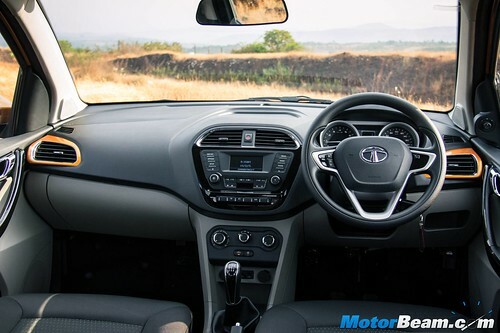 There are a lot of practical touches in the car, in fact Tata has equipped the vehicle with 22 utility spaces including a ticket holder on the windshield, recessed storage on top of the centre AC vents, cubby hole next to the gear lever, two cupholders next to the off centre handbrake, driver side storage pocket under the right most AC vent, tab holder in the glove box, front door pockets to accommodate two 500 ML bottles, rear door pockets to store one 1-litre bottle, glovebox with cooling function, hooks with weight markings (on the centre console and in the boot) and a decent sized boot with a low loading bay. Other interesting bits include the centrally placed cabin light which uses LED, adjustable driver seat height (but no adjust for the seat belts), button operated glovebox, mirror on both sun visors, knitted headliner, one touch down driver side window and a Tata typical illuminated key ring. Below the AC switches are sockets for charging, USB and AUX. The vehicle gets a flip key, key operated follow me home headlamps and rear parking sensors (there are four sensors which are concealed properly and graphics are displayed on the infotainment screen). What we miss on the Tata Tiago is a dedicated lock/unlock button (one has to pull the knob up and down now) while the front seat back misses out on pockets and the rear seat folds down in a single piece (no 60:40 here). The spare wheel isn’t an alloy and isn’t painted black either. 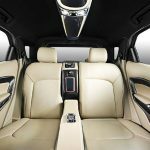 Space inside the cabin is good and there is ample legroom and knee-room (the seatback is scooped) but headroom is a bit lacking for tall passengers at the rear while seats could also do with more under-thigh support. 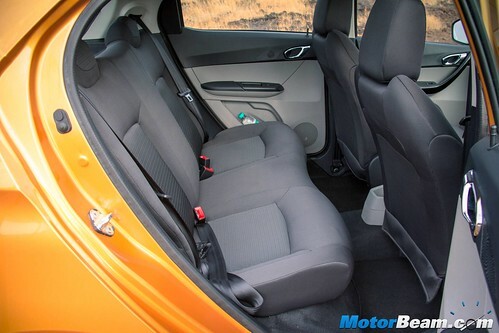 The seats are good and offer a lot of back support but the rear seat gets small, non-adjustable headrests. 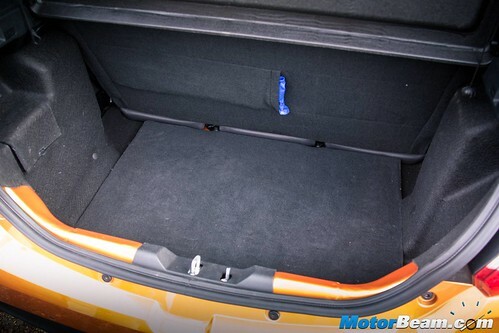 Three can fit in at the rear and the rear passengers can tuck their feet under the front seats. 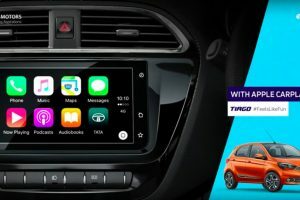 The Harman sourced ConnectNext audio system offers good audio quality through its 4-speaker, 4-tweeter arrangement and also gets NaviMaps wherein turn by turn navigation is displayed on the vehicle’s infotainment screen while connected to an Android device (using paid version of MapMyIndia maps which is free for a Tiago owner). The vehicle also gets a Juke-Car app wherein one master phone is connected to the car via Bluetooth and the same phone creates a virtual network (via WiFi hotspot) which others can join (up to 10) to jointly create a playlist, a helpful feature when multiple people are travelling in the car on a long journey. The audio system also has speed sensitive auto volume adjustment. 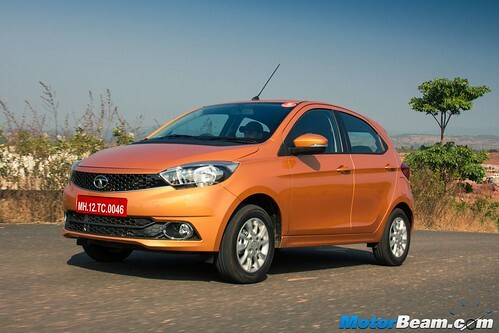 Performance – Tata Motors has developed two all new engines which debut on the Tiago. 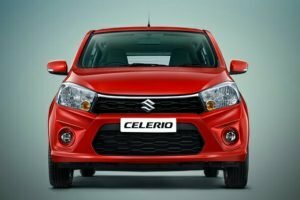 Both are 3-cylinder units and get multi-drive modes – City (default mode) and Eco (the Eco button is under the audio system, next to the fog light button). 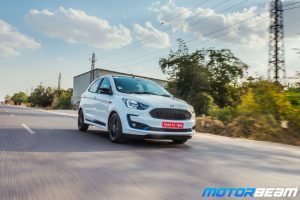 Performance for both the powerplants dulls down a bit in Eco mode with the motors not revving as quickly, thus to be used only when the car is on a mileage marathon. The petrol engine is called Revotron while the diesel is aptly named Revotorq and should return class leading efficiency. 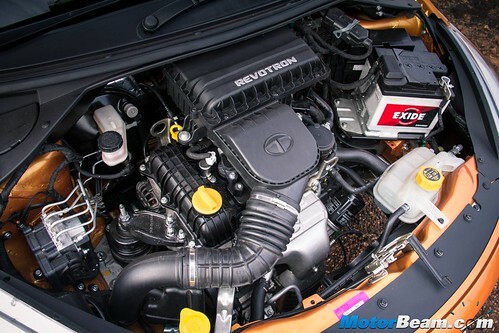 The 1.2-litre petrol mill is an aluminium unit with 4-valves per cylinder, DOHC and variable valve timing for the intake, so it gets the modern bits which is lacking in the other 1.2-litre Revotron engine that does duty in the Bolt and Zest. 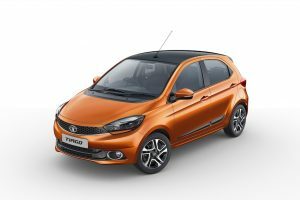 Driving Dynamics – Tata Motors has always found a good balance of ride and handling for its cars and the Tiago is no different. 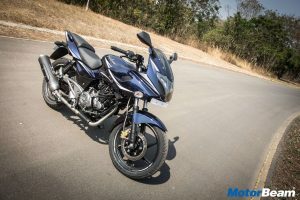 The suspension set-up is on the stiffer side (more so on the diesel with the extra weight) but the dual-path suspension and the tuning of the shock-ups is just right, ensuring even the worst of roads are dealt without ruffling a feather. Potholes or even jumping speed-breakers doesn’t affect the Tiago much and the ride quality is better on the petrol model but not by a mile. Straight line stability is good too and the vehicle remains composed at triple digit speeds, the Goodyear Assurance tyres offering surefooted grip levels. 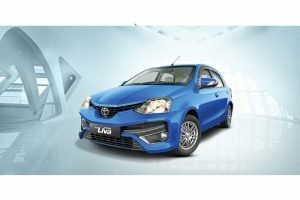 Safety and After Sales Service – In terms of safety, Tata Motors has provided front driver and passenger airbags along with ABS and EBD including cornering stability control that works with the ABS. There is speed-sensing auto door lock function along with immobiliser for the owner to feel safe about the car. With the HORIZONEXT program, Tata is making sure to improve their after sales service quality and it has come a long way compared to the old days. However, there is still some room left for better service quality. Tata has a wide network and reach across the country including Tier-II and Tier-III areas. 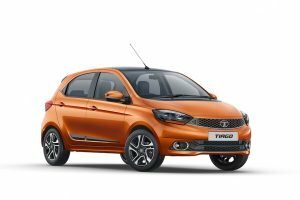 Verdict – Tata Motors has put in a lot of effort in making the Tiago and it shows in multiple ways, be it the styling, interior, equipment or comfort. 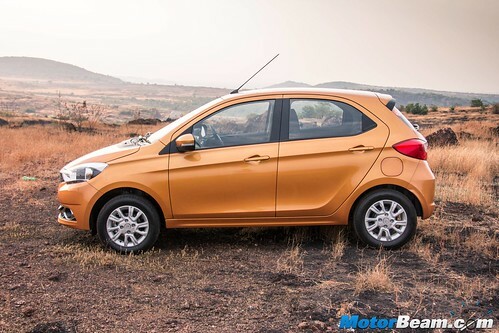 The company has taken a positive stride in certain areas where it has inherently been weak and that’s design, the Tiago is an attractive looking car with well appointed interiors and is loaded with a ton of equipment too. There are also many smart touches and the cabin is a practical place with all those storage bins. 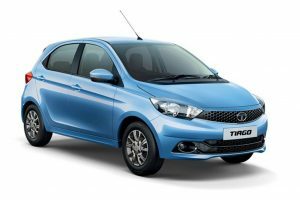 The engines lack highway performance (amplified by the heavier weight) but the Tiago is aimed at the city (the name says it all) and does offer adequate performance for driving in town. 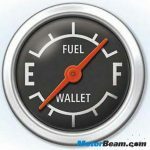 What it loses out in terms of highway performance, it certainly makes up for by being more frugal, something most buyers will appreciate. 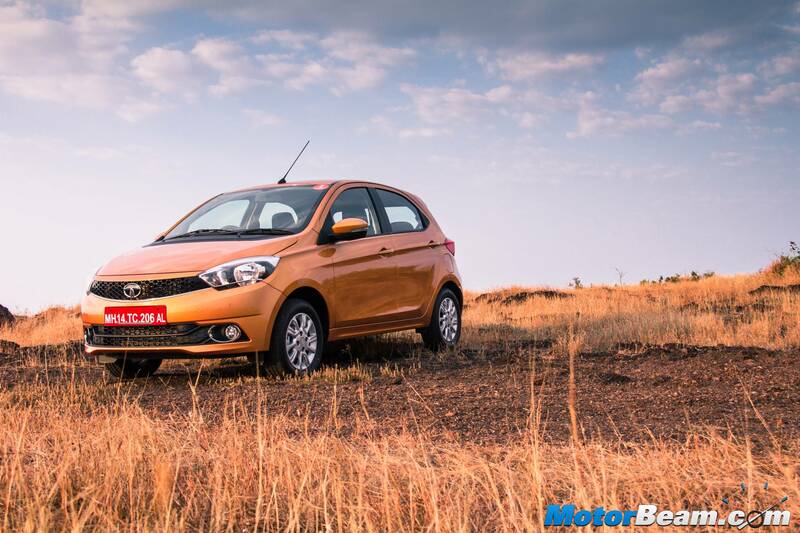 What made the Indica a huge success is being offered with the Tiago too as the latest Tata offers ‘more car per car’. The Tata Tiago is a well engineered product with lots of thought gone into fulfilling the requirements of city users. 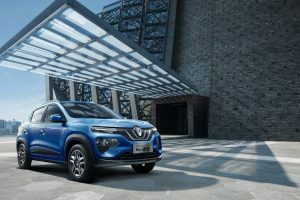 The biggest attraction to the vehicle is the fact that it feels much more expensive than it is which is surely going to help bring Tata Motors back in the game. 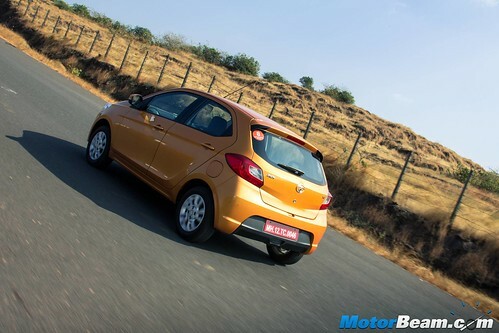 Doesn’t this angle remind you of the Honda Brio? 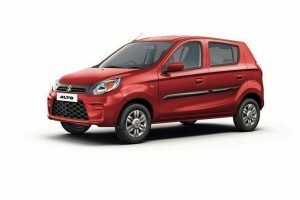 “The first all new product to come from Tata Motors after a really long time (I guess the Aria was the last all new vehicle) as the Bolt and Zest share a lot with the Vista. Lovely car for the city, not so much for the highway but considering its rivals too are totally lacking on the highway front, the Tiago is equally competitive. I really like the design and interiors while the performance feels more than adequate for city duties. 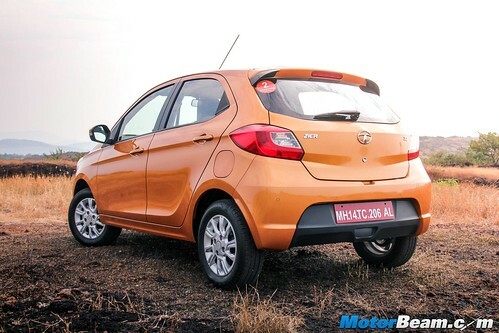 Tata Motors sure have a winner on their hands this time.” – Faisal Khan, Editor, MotorBeam. “It’s a nice city car and feels better than our long term Bolt in some ways like storage and design. The turn-by-turn navigation stands out (saved us when we got lost) and the Juke-Car app is a neat feature and will be helpful for those who travel with multiple people in the car. I liked the performance in the city but felt the lack of horses on Goa highways but the ride quality really impressed me. Lastly, I enjoyed shooting the Tiago, it’s by far the most detailed Tata car.” – Karan Pradhan, Photo/Video Grapher, MotorBeam.